Reimbursement for telehealth is not simple to understand. You can spend a couple hundred dollars on webinars trying to figure out how reimbursement works, and still not understand if/how to get reimbursed, or if private payers, or Medicare/Medicaid will cover the telehealth session. Plus, since reimbursement differs from State to State, and from plan to plan, there is no clear answer. Medicare/Medicaid, depending on State, may reimburse for the telehealth session + a telehealth originating site fee (CPT code Q3014). 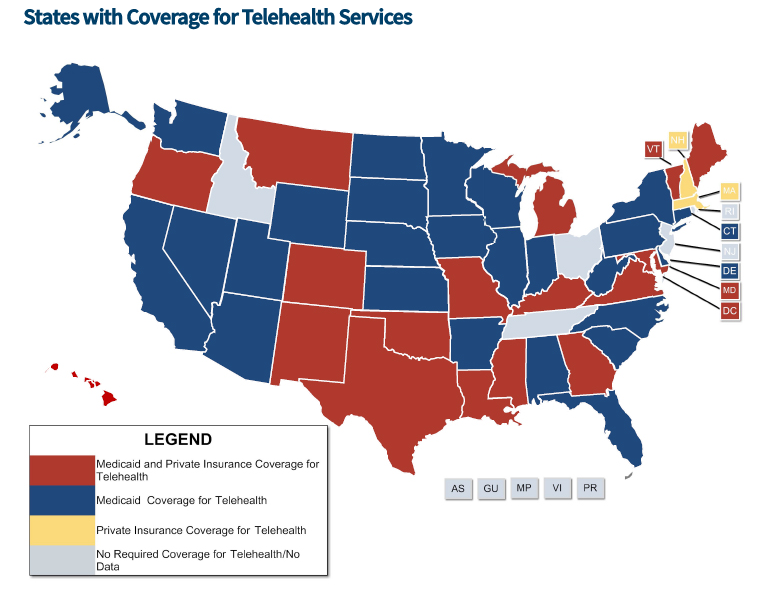 Private Insurance covers telehealth in 18 States (see the National Conference of State Legislature (NCSL) webpage to find out more about your State). The map below from NCSL shows which States do and do not cover for reimbursement.